Ella Screene in Business & Economics Editor's Picks World Affairs on 6 December, 2016. 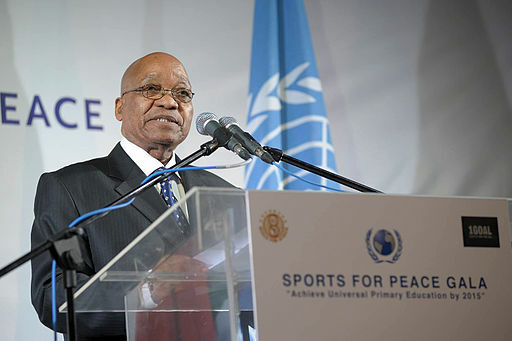 Mr. Jacob Zuma at the Sports for Peace Gala 2010 in Johannesburg. Despite South Africa’s recent political coup, Zuma appears to be grasping onto political power, surviving a vote of no confidence in parliament on 10 November. However, Zuma’s refusal to quit puts South Africa’s economy on even weaker footing. Zuma has faced mounting criticism and allegations of corruption, with this most recent political challenge stemming from increasing pressure last month from an independent state office. They charged him with giving the billionaire brothers Ajay, Atul and Rajesh Gupta, who run a business empire ranging from media to mining, undue influence. Yet how has the scandal-plagued president managed to retain majority support from the African National Congress (ANC), as this episode of political instability heaps further uncertainty onto South Africa’s already faltering economy? Regarding what Zuma has brought to the country his leadership has been saturated by accusations of corruption and fraud. Throughout his election campaign the people of South Africa were bewitched by his charisma and popular touch; his modest upbringing and promotion of family values spoke to the population, as they placed in him their hopes of wealth redistribution. However, in this he has evidently failed. Appearing to prioritize politics over economics, whilst presiding over a corrupt government, Zuma has failed to make any significant changes to South Africa’s economic policy, as the population’s hopes for Zuma have been shattered. While South Africa has managed to avoid the damaging ‘junk’ status from ratings agencies in 2016, to argue Jacob Zuma is good for the South African economy would be a stretch. In June Standard & Poor downgraded South Africa’s sovereign foreign currency rating to BBB – one level above ‘junk’ or non-investment grade status. South Africa’s long run fiscal and debt outlook is deteriorating faster than has been expected and combined with the risks of increasing political noise and contestation in 2017 South Africa’s economy appears at risk of further instability. South Africa has suffered from slowing GDP growth, mounting pressure on the government budget deficit and growing vulnerability of the current account deficit. These carry with them devastating implications. Slow GDP growth results in lower government revenue, higher fiscal deficits, weak investment spending, sluggish infrastructure roll-out and rising social and political tensions. Meanwhile, the combination of relatively high budget and current account deficits forces South Africa to fall dependent on capital inflows from foreign investors to finance these shortfalls. These leaves the country vulnerable to fickle investor sentiment and risk appetite. The ANC’s most recent failure to remove and hold Zuma accountable does not bode well for invoking confidence in the South African economy and political system for potential investors. However, it may pose an even greater danger for the stability of domestic politics and economics, as ministers who were behind this week’s bid for Zuma to step down run the risk of being purged by Zuma. These reportedly include Finance Minister Pravin Gordhan, his deputy Mcebisi Jonas, tourism minister Derek Hanekom and public works minister Thulas Nxesi. South Africa’s political system grants the president executive authority to directly shape the cabinet, an unchecked political power that the party has no hold over. Zuma has taken full advantage of this in the past, firing Nhlanlha Nene as finance minister and replacing him with someone who was virtually unknown. South Africa must now await the outcome and Zuma’s response regarding the National Treasury and ministries key to the economy, however increasing volatility appears to be an inevitable and unfortunate end for the future of the country.